Once again Savor California wowwed the trade with a spectacular 8-booth island at the biggest and best food show in the country. The San Francisco Wine Competition is the largest and most prestigious competition for American wines in the world. Along with many gourmet food and beverage producers from Savor California, hundreds of medal-winning wines were served at this event which sold out in advance. Sheri Tate of Silver Moon Desserts and Mari Rossi of B & R Farms joined Jane St. Claire of Savor California to be interviewed by Gene Burns on KGO's "Dining Around with Gene Burns." 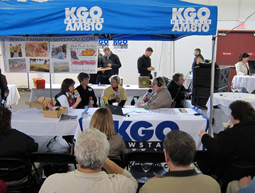 The program was broadcast live from the Chronicle Tasting. The best in the West was on display at this show on the beautiful grounds of the Sunset Magazine Headquarters. 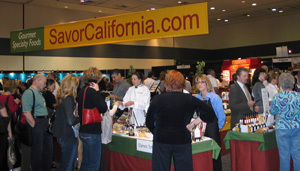 Savor California had another big booth, with 17 companies offering their gourmet food products for sampling and for sale. 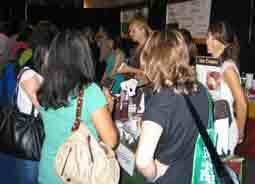 Attendees told us that the Savor California booth was the "destination booth" at the Sunset Celebration. Maybe that's because everyone in the booth was having so much fun selling their products and interacting with the folks. That included the crews from Cypress Grove Chevre and Sugajules Artisan Granola, who were ready to rock 'n' roll! Savor California returned to the Big Apple for the Fancy Food Show with these wonderful products: Scoma's Seafood Cakes, Sparrow Lane Vinegars and Olive Oils, Donsuemor Madeleines, Amella Caramels, Agave Dream Ice Cream & Sorbets, B & R Farms, and Taylor Brothers Farms Dried Plums. Sparrow Lane was a Silver Sofi Finalist for their Champagne Walnut Vinegard. Stacey and Jean of Agave Dream received an enthusiastic reception for their agave-sweetened ice creams and sorbets. What an amazing party! Members of the San Francisco Professional Food Society and their guests enjoyed a spectacular barbecue menu designed and made by Nick's Cove Executive Chef Adam Mall, using gourmet food products from SavorCalifornia.com. 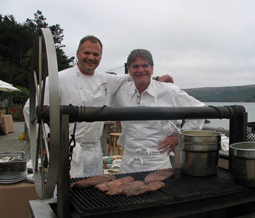 Chef Adam Mali of Nick's Cove and Fred Martin of the SFPFS, grilled up fabulous steaks from Brandt Beef. Tomales Bay is behind them. 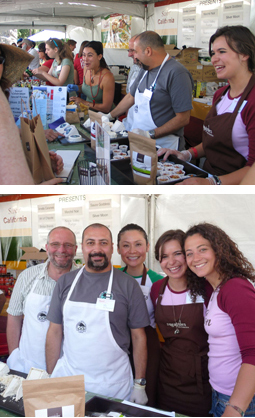 The Savor California booth at the Harvest Festival was rockin' and rollin'! Napa Valley Fudge, Pollen Ranch, Sauce Goddess, and Spindel Farms offered their gourmet products for tastes and purchase, and there were lots of buyers! Santa came to talk with Elizabeth about Pollen Ranch's spice mixtures.